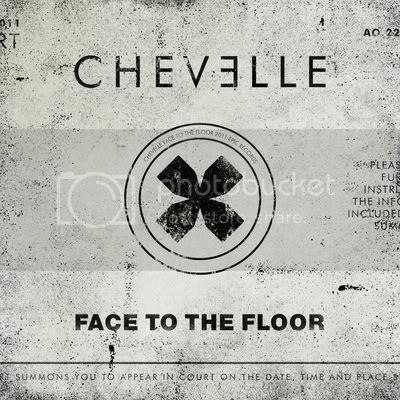 Chicago hard rock trio CHEVELLE will return December 6 with Hats Off To The Bull, their sixth full-length album. The album's first single 'Face to the Floor,' with its hypnotic, grinding riff, is one of the most explosive songs of the band's career and is blanketing the airwaves nationwide. 'Face to the Floor' rails against the corporate corruption of Bernie Madoff and Wall Street. "It's an angry song," reveals lead singer Pete Loeffler about the inspiration for 'Face to the Floor.' "The lyrics are about all the people who have been taken advantage of. I reference Bernie Madoff and his Ponzi scheme. He raked people over the coals, stole and is a terrible person. One day, these people have everything, and the next day it's completely gone." Chevelle will celebrate the release of Hats Off To The Bull with an appearance Thursday, December 8 on ABC’s Jimmy Kimmel Live (12/11c). This summer, Chevelle hunkered down in a Los Angeles studio with producer Joe Barresi (QUEENS OF THE STONE AGE, COHEED AND CAMBRIA). During the sessions, nothing was off limits, and boundaries were non-existent. Rather than simply subscribing to a tried-and-true formula, they made a conscious effort to incorporate new sounds and textures into their patented airtight anthems. As a result, Hats Off To The Bull is one of the group’s most infectious and impressive offerings to date. "We're a melodic hard rock band, but we wanted to expand on what that means. It's really important to be aware of what you've done already,” says drummer and Pete’s brother Sam Loeffler. “We never want to write the same song twice. Pete writes 300 days a year. Joe encouraged us to try different instruments and techniques and he pushed us to continually play everything until it was right too. There are so many nuances as a result."